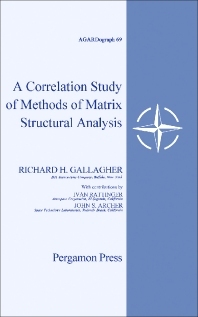 A Correlation Study of Methods of Matrix Structural Analysis describes the results of a survey and review of airframe matrix structural analysis. The book also explains concepts of force and displacement, as well as the techniques for determining the force-displacement properties of discrete elements employed in analytical idealizations of structures. The text investigates the results of extensive analyses of multiweb low aspect ratio wings, using past evaluative studies and idealizations contained in reports of the AGARD Structures and Materials Panel. The techniques describe in the Panel and other techniques in matrix structural analysis lead to identical formulations of the governing equations. The differences between various references with respect to idealization are independent of the formulation of the governing equations. The solutions to governing equations are precise solutions for the postulated discrete element system. The book also describes a recommended computer program development using whichever is more appropriate between a force approach or displacement approach to matrix structural analysis. The text is valuable for researchers in structural analysis, aeronautics, applied mechanics, and investigators of aircraft engineering.